Open Arms Worldwide (OAW) is a Christian organization dedicated to the spiritual, moral, emotional, physical and social enrichment of children and youth who live in under-served or forgotten communities around the world – communities where families and children are at higher risk of becoming victims of poverty, crime, violence, addiction, abuse, and social marginalization. Christian hope is the distinctive of Open Arms and the catalyst that sets life transformation into motion. The Christian faith instills a hope that is not dependent on physical circumstances. This hope results in resiliency, perseverance, healthy socialization, a sense of history, community and belonging, and strong moral and civic character. These are exactly the attributes that these children require if they are to overcome the obstacles before them and fulfill their God-given potential. RBC currently provides support to two OAW missionary families, including Eduardo & Claudia Ribeiro, who shared at our worship services last weekend. This year, OAW celebrates its tenth year as a ministry organization. For a decade, Open Arms has been bringing hope to children who live in under-served and forgotten communities in Brazil and here in the U.S. What began in one small community in the interior of Brazil has been replicated in 12 communities across 3 states in Brazil, and serves more than 1,000 children weekly. Since 2013, OAW has also worked with local stateside churches and schools from their U.S. headquarters in Sterling, Virginia. Please pray for OAW, their “agents of hope” and the children they reach with the hope of the gospel. 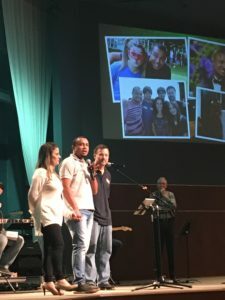 Here are some stories from the field of how lives have been changed as OAW seeks to know Christ and to make Him known in Brazil and beyond.